Customers are calling it the most realistic and challenging fishing game they've ever seen. 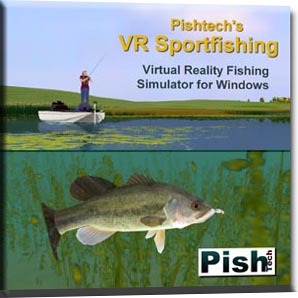 Our newest fishing game - This highly realistic full 3D fishing simulation is rapidly gaining new fans! Now with more lakes, more species of fish, live bait, realistic changing weather, dynamic lighting and even night fishing! Accurate fish behavior for weather, seasons, etc. - "The most realistic and challenging fishing game I've ever seen"
- "It's about time we get a REAL fishing sim! Thank you, Pishtech!" - "The game is full of surprises, just like real fishing. At a time when other companies are silent on the fishing front, you've set the new standard. Thank you for creating this great game." - "When I got my boat, I went surface popper fishing and it was just like being on my favorite lake! I caught two nice bass with the popper. I love this game"
- "Fishing a tournament in the rain was so realistic I had to put on a sweatshirt to fight off the chills"
- "A great fishing-game with very realistic fish-behavior. It's a great adventure to get the big ones. Beginners can learn very much for real fishing." - "VR Sportfishing is worth getting excited about! Still in Betatest mode, it is already the best fishing game I have ever played on my computer!! Believe it! ... I love to use surface lures in real life, and this game is the next best thing to that. Last night, I tossed my surface frog lure to a little bass, only to have a huge pike come out of nowhere and take it instead! Very cool! Rapala Pro? FLW Tournament, Bass Masters? This game beats them all!"